In the final project of the year-long series We.Construct.Marvels.Between.Monuments., artistic director Libby Werbel partners with Deep Underground (Bethlehem Daniel, Madenna Ibrahim, Mia O’Connor-Smith, and Janessa Narciso) to present MONUMENTS. 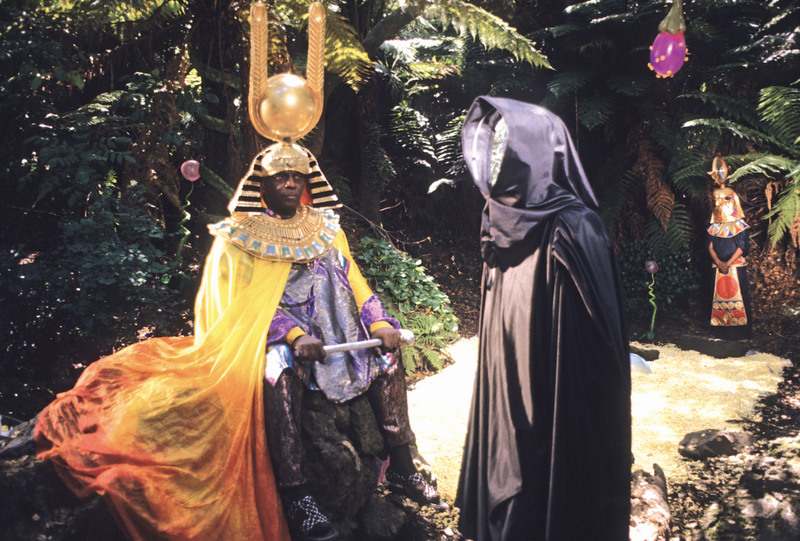 The Earth Expedition of Sun Ra ―a multimedia presentation of film, music, and art by Afrofuturist artist, musician, and philosopher Sun Ra (active on earth 1934 – 1993). As the critical conversation develops around the removal of public monuments across the American landscape, we ask ourselves: what are the new monuments we wish to build? Who are the artists, thinkers, and heroes we wish to exalt and preserve for future generations? MONUMENTS. upholds Sun Ra as one of these visionary figures. Sun Ra was a jazz composer, musician, bandleader, teacher, and poet who became known for his theatrical performances and personal mythology: his name references the Egyptian sun god, Ra, and his origin story proclaimed that he had come to Earth from Saturn. Sun Ra has been considered the pioneer of Afrofuturism, a school of thinking that utilizes science fiction, music, art, and political theory to propose a thriving destiny for black people. From the mid-1950s on, he led a musical ensemble best known as The Arkestra. They were infamous for their avant garde jazz compositions, dances, and clothing inspired by ancient Egypt and the space age. Sun Ra and The Arkestra collectively lived their lives dedicated to preaching peace and promoting enlightenment through their music, art, and film. The exhibition and accompanying performances highlight Sun Ra’s idea of an “altered destiny,” a utopian belief that a more meaningful and just world awaits humanity in Outer Space. To Sun Ra, Outer Space was not an escapist fantasy―it was a place where society, culture, and beliefs are reimagined to give power to the oppressed. Sun Ra’s message still resonates with many people, including Portland’s Deep Underground community, who have embraced his philosophy and see his art as a hopeful vision that offers significant pathways for black and brown identity. Sun Ra and his collaborators left a comprehensive archive including 130 albums, countless books and broadsheets of poetry, posters, paintings, photographs, and performance attire. The exhibition includes artifacts on loan from the University of Chicago’s Alton Abraham Collection of Sun Ra Archive, with supplemental support from private collectors and music enthusiasts. Regional artists, fabricators, and designers have contributed to the exhibition design to help bring Sun Ra’s world to life for PAM visitors. Organized by a cosmic kin of four women, Deep Underground (DUG) was originally founded in 2015 as an open mic project dedicated to instilling a sense of safety and freedom within Portland’s under-recognized black and brown community. Their work began in a 100-year old NE Portland home, creating intentional space to empower unsung people. Their open-mic sessions often end with discourse or reflection on themes of the times such as: Revolution, Vices, Love, Addiction, Human/Civil Rights, and Death. By creating a space to talk about revolution, these women have started their own. Since their genesis, DUG has gone on to throw large-scale events, in-depth youth programming, film screenings, concerts, and multimedia performances. The collective recently addressed city hall with the hopes of providing insight into the needs of black and brown artist communities. Their foundation is rooted in much of the same work Sun Ra was doing over 50 years ago; it is in that spirit they have been invited to lend their perspective and curatorial vision to the exhibition representing this afro-cosmic hero. We.Construct.Marvels.Between.Monuments. is organized by visiting artistic director Libby Werbel in collaboration with the Museum’s curatorial and education departments. Funding is provided in part by the Miller Meigs Endowment for Contemporary Art, The Arlene and Harold Schnitzer Endowments for Northwest Art, and the Artist & Participatory Programs Fund of the Education Department. Public programs presented in partnership with c3:initiative. MONUMENTS. was made possible through additional support and sponsorship from Portland Garment Factory, Nike’s Blue Ribbon Studio, Form.xyz Foundry, and KMHD Jazz Radio. With generous consultation from Eric Isaacson at Mississippi Records.